Here’s the latest press release on the recent Asian Carp eDNA results near Lake Michigan via Great Lakes Information Network (GLIN). Comments to follow soon, but need to emphasize these are eDNA results, and positive samples have been found above the electric barrier before. Media headlines are likely to sensationalize these results as in the past. 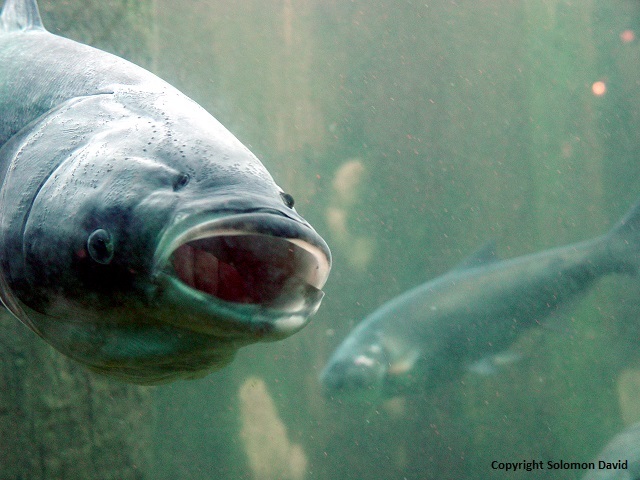 (Wednesday, January 14, 2015) Chicago, IL – Asian carp continue to knock on the door of the Great Lakes, based on eDNA sampling results released last week by the U.S. Fish and Wildlife Service. The sampling data, collected in October, show the presence of bighead or silver carp DNA throughout the Chicago Area Waterway System (CAWS). Most alarming is detection of carp DNA very near the lock in downtown Chicago – less than one city block from Lake Michigan. In the face of this threat, last winter the U.S. Army Corps of Engineers released its Great Lakes-Mississippi River Interbasin Study (GLMRIS) with no clear recommendation for next steps to prevent Asian carp and other aquatic invasive species from moving between the Great Lakes and Mississippi River. The GLMRIS report does, however, identify restoring the natural divide between the two waterways as the one long-term solution effective in preventing the movement of aquatic invasive species between the Great Lakes and Mississippi River basins. The report identified 13 invasive species at significant risk of moving between the waterways. Despite this finding, agencies and elected officials have yet to commit to this solution. A committee of key, diverse regional stakeholders known as the “Chicago Area Waterway System Advisory Committee” has been formed with a goal to reach consensus on a set of recommendations to elected and appointed local, state and federal officials and the public on short-and long-term measures to prevent Asian carp and other aquatic invasive species from moving between the Mississippi River and Great Lakes basins through the CAWS. The Advisory Committee is working toward a deadline of Dec. 15, 2015, with interim work products as appropriate. Research to further evaluate reconfiguring locks as a means to control aquatic invasive species while maintaining the health of native aquatic life and habitat. DNA evidence is an early detection tool to understand the potential movement of carp, and testing results have consistently found DNA hits on a path closer and closer to the Great Lakes over the past several years of testing. We cannot afford to wait until a breeding population shows up in the Chicago River. Prevention needs to happen now, and the U.S. Army Corps of Engineers and other key decisionmakers should take swift action. This entry was posted in Great Lakes and tagged Asian Carp, AsianCarp, carp, Great Lakes, Great Lakes fishes, Invasive Species by Solomon R David. Bookmark the permalink.